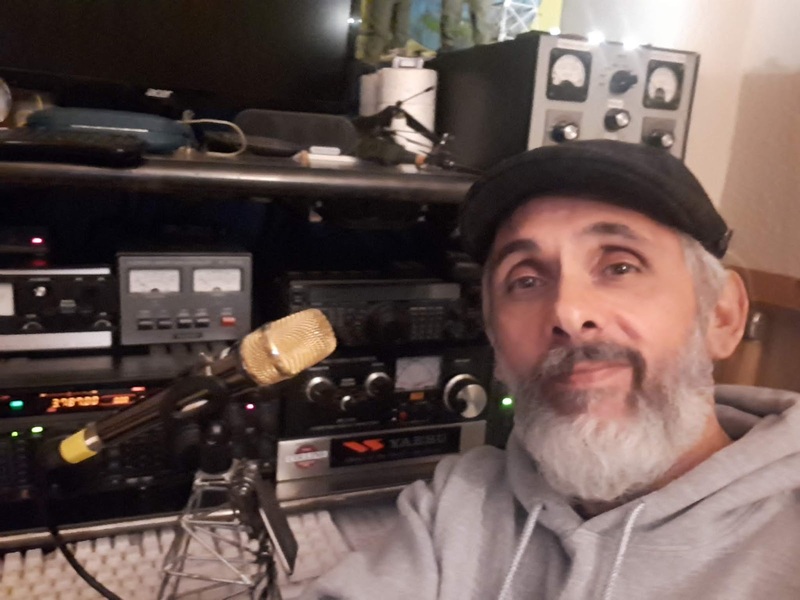 This year was just as awesome as ever even though band conditions were limited I still worked lots of World Wide DX during the 2018 CQ WW SSB Contest. I managed to get in quite a few hours here and there throughout the entire contest and spent a lot of time on 15m and 20m during the daylight hours where I worked some big signals from Asia, North and South America as well as a few slightly weaker signals such as China and Japan. 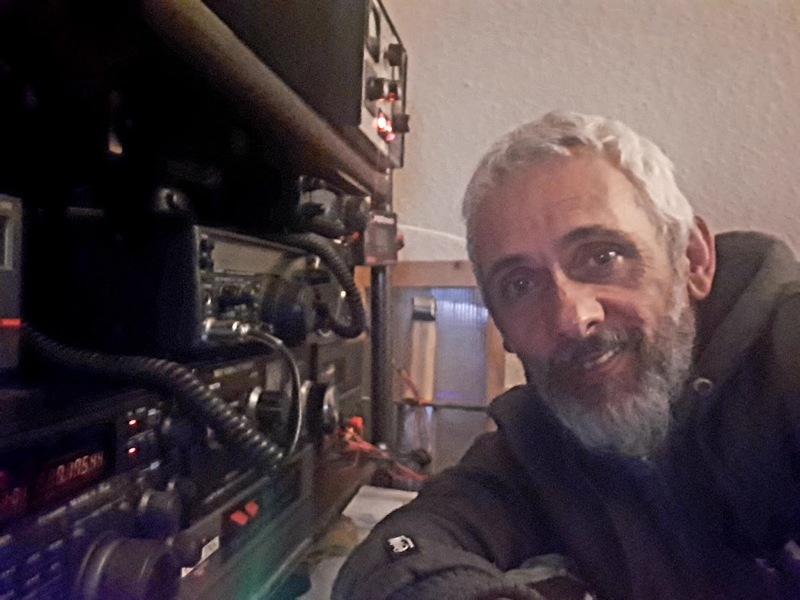 I was pleased to catch three stations in a row from India with armchair copies up on 15m and all in all I did quite well with the help of my latest addition the G17B amplifier. The Cushcraft MA5B Beam worked well on 15 and 20 meters and my Hustler 6BTV vertical with radials did it for me on 40 meters but the biggest surprise was the dipole which I cut for 80 meters which was previously the windom. As a designated 80m dipole I was able to get some good signals out with the extra power (400 Watts) I worked some good DX multipliers on 80 meters into North Africa, Cape Verde, Cyprus, Russia and Kazakhstan. 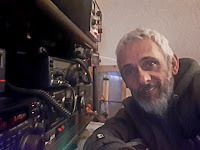 I also got to work fellow Ham, Blogger and YouTuber PE4BAS as PA6AA on 80 meters towards the end of the contest which was another good copy and great QSO. ''Thanks Bas'' As usual I took a few moments to catch some of the weekend on video for those who enjoy seeing the action at my end. You can see for yourself here. In the end I worked 247 Stations, 65 countries and 19 out of 40 world zones,which was lots and lots of fun throughout the entire weekend. 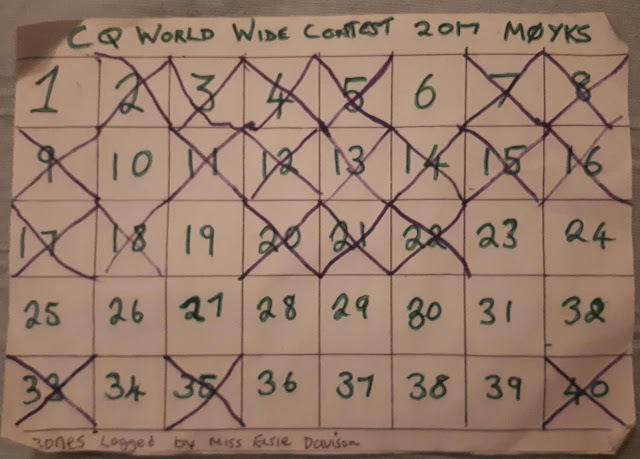 My log has been uploaded to the contest site and I cant wait to do it all again next time. The last bit made me smile a lot. My oldest daughter Elsie helped me log the CQ WW DX Zones last year and sure enough both Elsie and her younger Sister Martha were excited to help their Dad during this years CQ WW contest. This time around they made up their own version of a Zone check sheet and added a few comments which made me smile tonight when I read through it properly. I especially love the bit that says'' its really exciting ''and ''there's a lot of numbers''. Hams of the future! lol Watch Out! Well I will say thank You to all who worked me during this years CQ WW DX Contest and finally see you in the contest next year! To my ham radio blog followers and friends, Best 73 and thanks again for dropping by ham radio Operator Blogspot. See You again soon for more madness. It's half term at College so I get to catch my self up a little and spend time away from the busyness of teaching, relaxing and spending quality time with my lovely family. 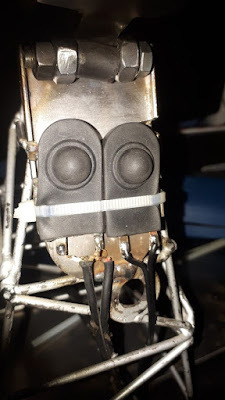 So far I have been doing some D.I.Y jobs around the house and in between the fun I have been on my ham radio station making the final checks before the up coming weekend. This weekend if you did not know or perhaps had forge,t is the one weekend where I give my full attention to the HF bands. It's when I try my luck at making contact with as many stations as possible from as many zones as possible out of a total of 40 worldwide. 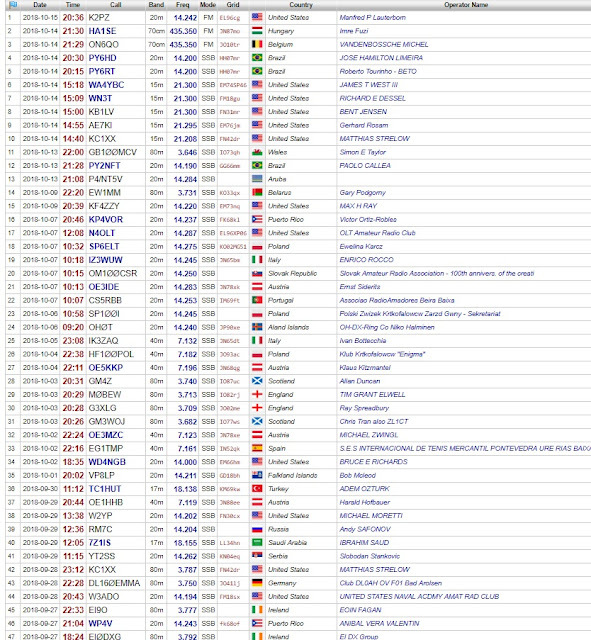 It's that time again for CQ World Wide DX Contest fun!! More info at CQ WW DX SSB site. Last year was amazingly good despite average to poor band conditions I ended up in 3rd place as Low Power, England which was probably a one off lol. 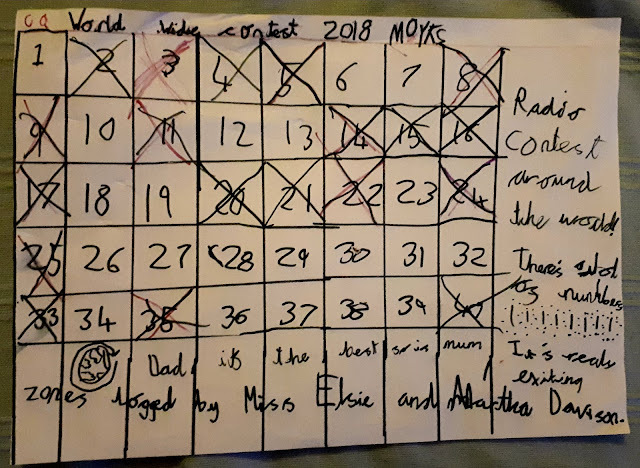 Last year my oldest daughter was keeping track of the zones that I worked which ended up at 21 zones out of 40. I can imagine I will need two zone sheets this weekend as my younger daughter is definitely going to want to get involved as she is showing the signs of ham radio fever already at 4 years old. I will be knocking up a simple method of recording the zones or should I say the girls will, similar to last years. I was checking propagation when I heard The ARRL Head Quarters coming in on 20m. The best bit was when he herd me calling on 20 watts. Check out the video and see for yourself. 73! The last two weeks have been interesting on the bands especially with the new Russian G17B x2 amplifier in line and working well. I have made the most of the propagation which has been up and down but worth the effort, as I put out some nice signals into North and South America as well as the Caribbean. I am really pleased with the G17B amp and have mastered the tuning and loading with no issues or difficulties. I feel much more comfortable with the reliability and duty cycle of the Russian made Ceramic tubes compared to a transistor amp which seem less forgiving of any minor operator errors. I have backed the mic settings off slightly for my Heil GM5 studio microphone and have been putting out 20 -30 watts from the FT-1000MP Mark-V Field transceiver into the amplifier and getting 350 - 400 watts out. 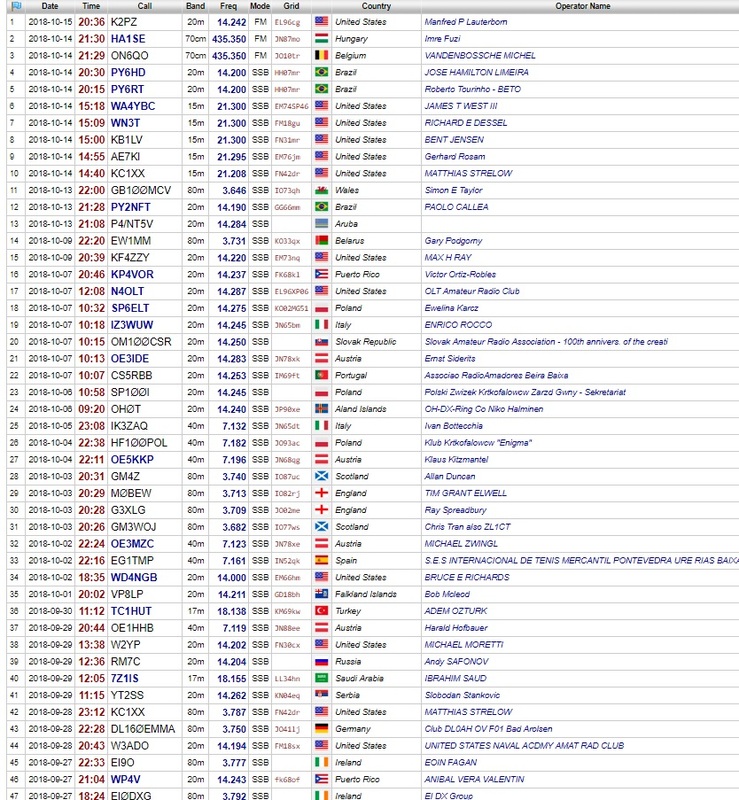 The reports have been very encouraging, all that is left to say is CQ World Wide SSB Contest 2018, here I come!!! The new amplifier is set up to operate via a separate PTT which was a foot pedal. I found this easy enough but had a better idea to try out with a couple of TIG welding torch rubber insulated switches that I had lying around. 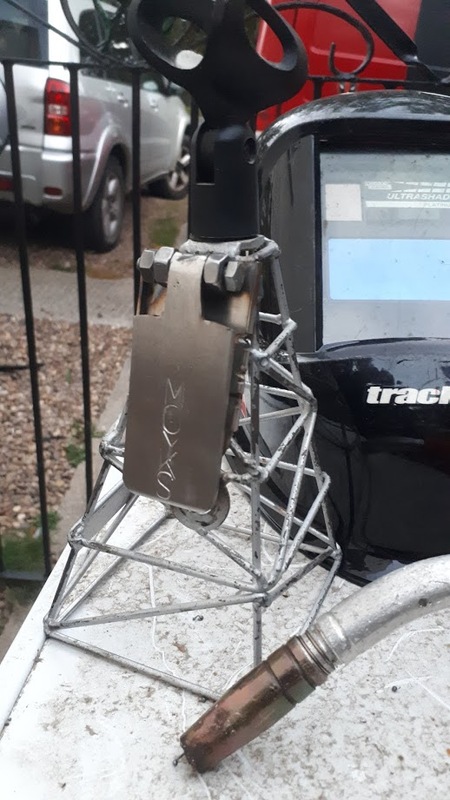 I began by making a stainless steel cradle to house two switches which would be one for the radio and one for the amp. I then tacked the whole assembly to my previously home made microphone tower. I used a piece of stainless steel as a gate type switch system which makes contact with both switches to activate transmit on my transceiver and amplifier simultaneously. whilst testing out the new double PTT set up I worked Bruce WD4NGB just as the 20m band was grey lining and fading. Feeling very pleased with myself after a bit of ham radio making! Best 73! 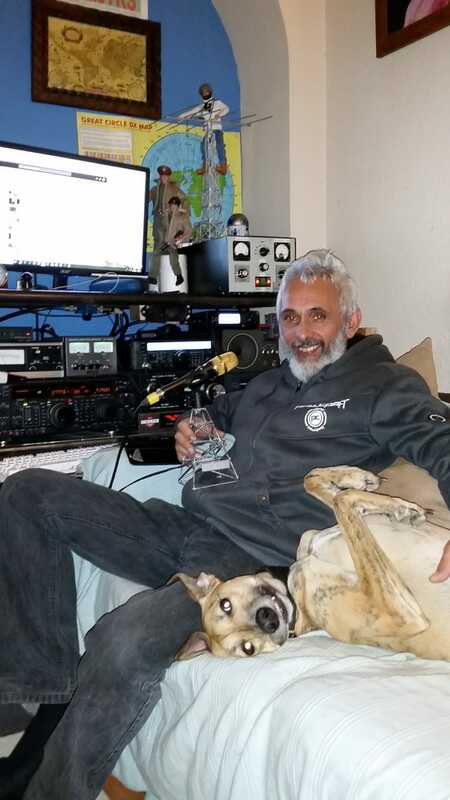 It looks like Finn the lurcher is loving my ham radio activity. Earlier I had my new amp ticking over as I worked Bob VP8LP down on the Falklands.